Kitchens are the heart of most homes — where you cook, share a meal, and socialize with friends and family. You spend a significant part of your life in the kitchen. So it’s no surprise that this room is one of the most popular to remodel. What better way to improve your house than to revitalize the space that’s become the new focal point of the American home? If you are ready to make a change, we can help. Our team knows what it takes to create kitchens that are both functional and beautiful. Our licensed architectural staff have the expertise to guide you through the design and selection process, offering the highest level of service in the industry. 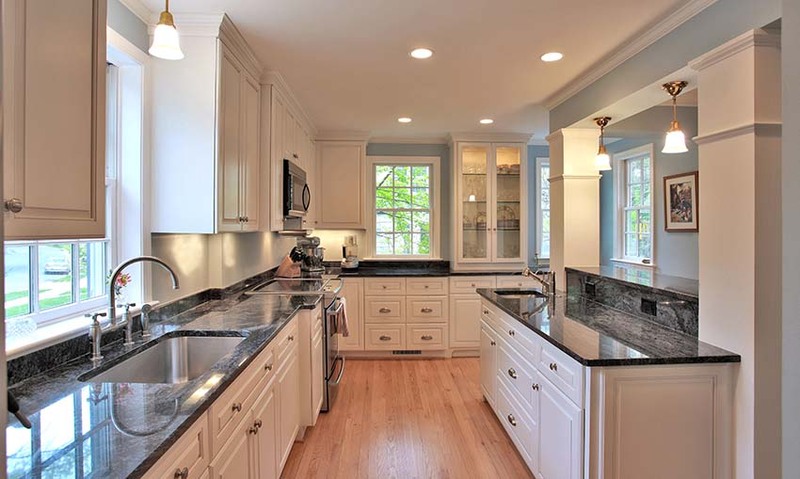 Let us work with you to assess your current kitchen and propose ways to make it better. Give us your vision and let us help you determine how best to make it a reality. Contact us today and let’s get started! There is almost always a solution to expand a cramped kitchen, but often this concept can be hard to visualize. That’s where we come in. We love working with our clients to develop unique solutions that alleviate their kitchen woes. In previous eras, home design was rooted in formality. Houses were divided into a series of smaller rooms, each with a singular function. Formal living and dining spaces graced the front of the home while the kitchen was tucked into the rear. Thought of as a service space, the kitchen was used for food preparation and nothing more — no connection to the rest of the home, no space for socializing, and little room for more than one cook. Today, we have adopted a more casual, family-centered lifestyle with the kitchen taking center stage. No longer hidden in some corner of the house, the kitchen has become the family command center with room for a lot more than just cooking. 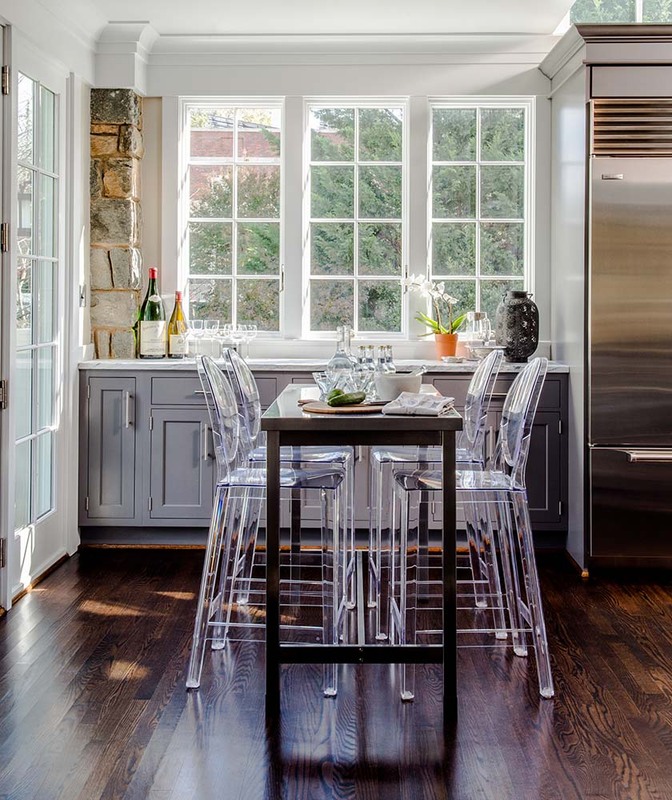 Our ever-expanding definition of “kitchen” now incorporates space for dining and casual seating seamlessly woven into the fabric of a functional kitchen. And let’s not forget about the beauty and detail of modern kitchens. 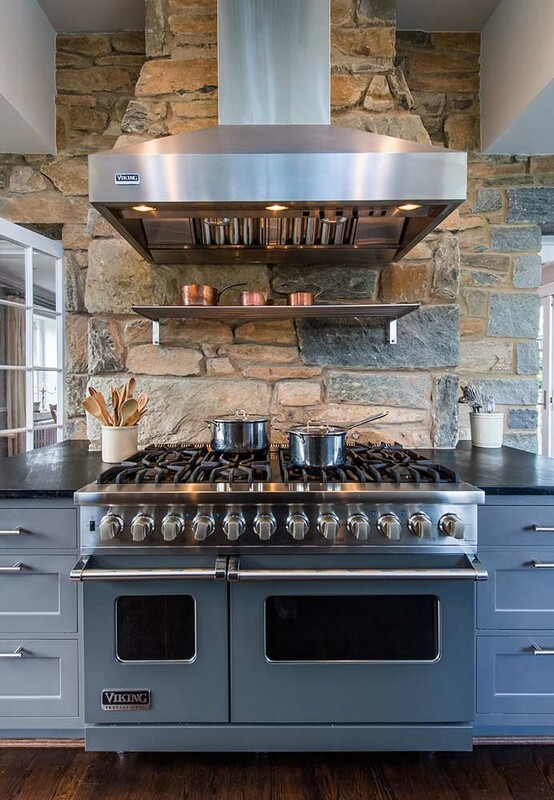 With large islands, commercial-grade appliances, abundant storage, and expansive countertops, they are functional pieces of art worthy of display. People usually don’t realize this, but there is often underutilized space within a home that can be repurposed to expand a cramped kitchen. In an area where space is limited, creativity is key. Though every project is unique, here are a few strategies for reinventing your kitchen. Walled-in, a kitchen can feel small, confined, and cut off. Targeted removal of walls can visually expand the kitchen creating the illusion of space without actually adding any. If the kitchen footprint works, removing walls will offer a new sense of openness and connection between surrounding spaces. It can also simplify circulation patterns in and around the kitchen. While I knew I would like it better after the renovations, I expected to feel pleased, not in love. But it turns out my house was transformed, and I LOVE IT! I have the EXACT kitchen and porch of my dreams, had I believed such lofty dreams were possible. A recent Bethesda kitchen remodel boldly illustrates this theory. Removing the wall that once separated the kitchen and dining room had a dramatic effect for this “dead-end“ kitchen. With a new found sense of openness, a natural pattern of circulation has been established to allow for harmonious interaction between the kitchen and surrounding spaces. Greater than the sum of its parts, the kitchen and dining room have been unified into a multi-function space — as perfect for a formal gathering as it is for everyday use and enjoyment. The new island defines a boundary between spaces while still allowing interaction from one space to another. Cooking in this kitchen is no longer a lonely task. Sometimes we find there just isn’t enough space for expansion within an existing home. This can be especially true on the narrow lots and row homes prevalent in and around Washington. One D.C. client faced this very problem in their tiny kitchen. The narrow house footprint left little room for circulation causing a traffic jam in the kitchen. Though previous renovations attempted to improve the function and flow of the space, none were successful at resolving the underlying circulation problem. A thoughtful addition finally gave the family the room they needed to spread out. The new rear addition becomes an elegant destination point, drawing people through the home. The multi-use space includes a gourmet kitchen, breakfast nook, and comfortable seating area. The new addition also freed up space within the existing home. 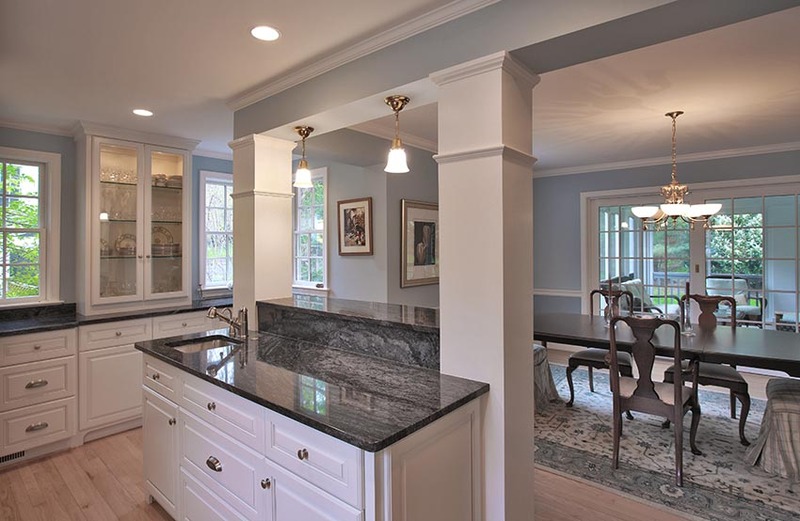 Previously lacking space for storage closets and a first-floor powder room, those features now fit and function perfectly in the old kitchen space while also providing a seamless circulation link between the existing house and new addition. 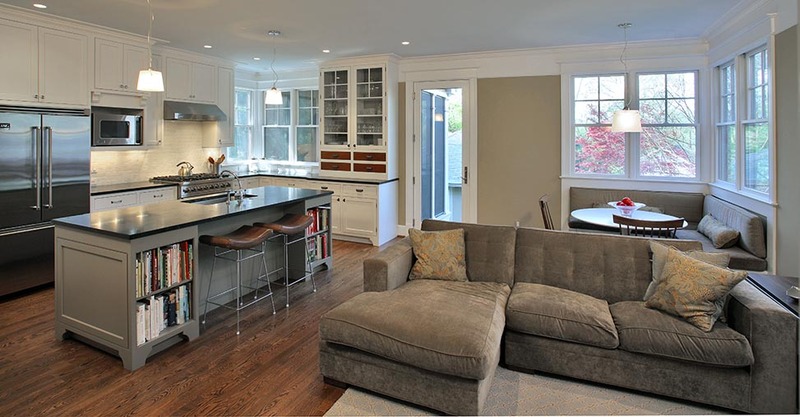 Have you ever thought about moving your kitchen to a completely different location in your home? From time to time this can be the perfect solution for a cramped kitchen, especially if you have rooms in your home that get little or no use. This was the case for one Chevy Chase client. Relocating the kitchen to a previously enclosed porch gave easy access to the most frequently used parts of the home. The new location also opened up the possibility of a kitchen with abundant windows. Three sides of the room have a view outside, so almost any time of day, the kitchen is washed in sunlight. Pairing rustic materials and earth tone colors with fine cabinetry and modern appliances further blurs the line between inside and out. A perfect marriage of form and function, this kitchen is eye-catching to say the least.